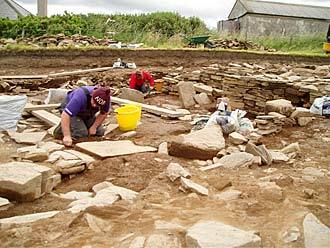 This morning began with finishing the cleaning back in all of the structures on site, freshening the soil, removing dust and debris from the stones and generally making the Neolithic buildings look neat and tidy. 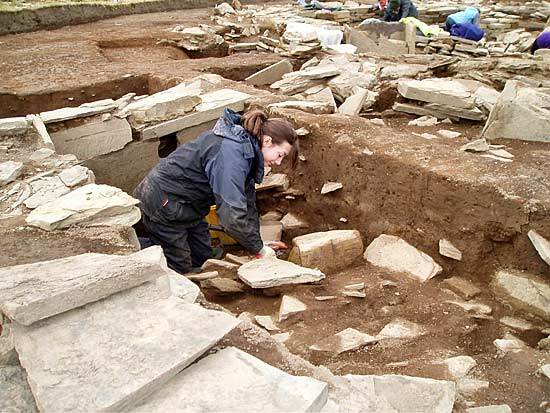 It is an irony, which does not escape those who have to wash their work clothes, that archaeologists spend so much time cleaning their sites, but remain irredeemably grubby themselves. A much misunderstood bunch! 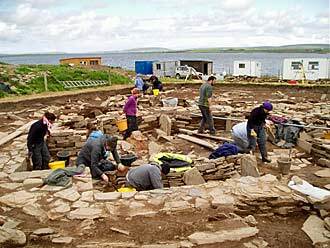 Despite the off-putting sight of the workers, the first tourists arrived to visit the Ness of Brodgar site in droves today. Last year, we had over 5,000 visitors over the six weeks of digging. This year, with another six weeks in prospect, we are confident of exceeding that total easily, as well over a hundred of them pulled into the site today. Showing the visitors around is a real pleasure. It is every bit as much their archaeology as it is ours, and almost all of the visitors are fully engaged with the amazing archaeology they are seeing and full of sharp and intelligent questions, which often leave the tour guide scratching his head. Many of the visitors are returning for the umpteenth time. 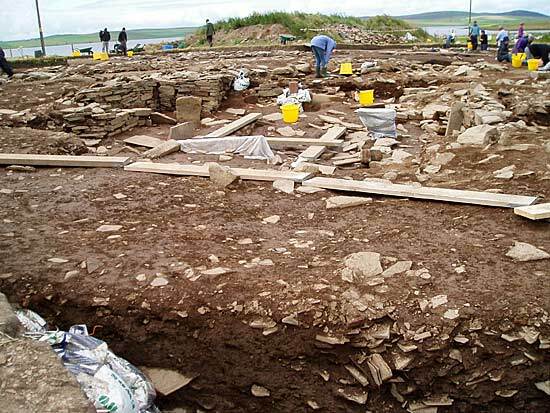 One Dutch couple, who arrived yesterday, had spent several holidays in Orkney without seeing the Ness of Brodgar. 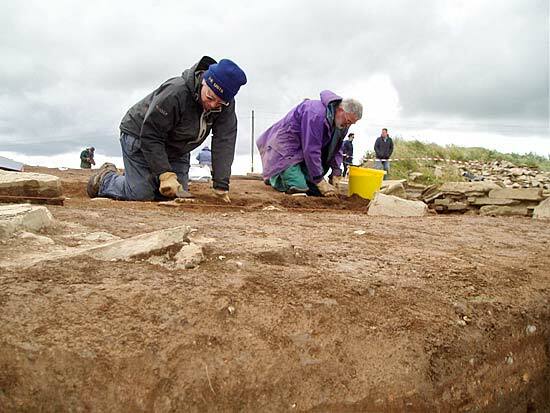 This year, they checked us out on the website and booked their holiday especially to coincide with the dig. We look forward to seeing them again. The archaeology is progressing fast. In Structure Ten, Antonia and her team continue to define the area of the central chamber. She is hoping to find the entrance, although there is every possibility that it has been robbed out, or at least seriously damaged, in antiquity. Adam has also found another incised stone within the central chamber – watch this space for a photo. Structure Eight continues to amaze. The heavy overburden of midden, which covers half of it, is being removed, and today another pier turned up, exactly where Nick had forecast. The Neolithic builders had constructed their piers with such regularity that he had simply measured the distance between two existing piers, and extrapolated that to the un-excavated section. This means that his other prediction – that Structure Eight would turn out to be around 20 metres long with six (compared to four in Structures One and Twelve) main side recesses – is also likely to be correct. Elsewhere in Structure Eight, another hearth has emerged, making a probable three in total (so far revealed!). This one is located between two piers, possibly making the journey from one end of the structure to the other a tortuous, or difficult, one. Is this another example of the Neolithic builders deliberately placing obstacles in the way of those who entered the buildings? Structure Twelve has a deliberately narrowed and angled entrance, and so does Structure Eight. The pace of events is quickening and we are looking forward to Day Four with real excitement. 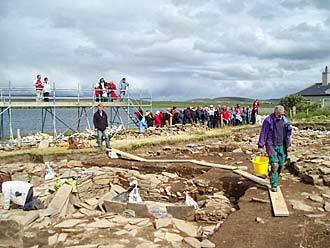 I’m a student from Sydney University, in Australia, having completed a year exchange at Glasgow University, where I found out about the Ness of Brodgar from another student, who volunteered last year. 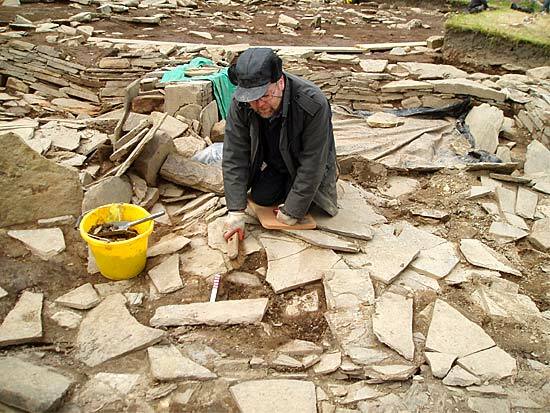 Being only day three of work, we have succeeded in uncovering the site, removing hundreds of sandbags and stones, and are now completing the cleaning of the site, and all the surfaces, to remove the broken stone and trampled soil from the winter. My first impressions of the site, even with everything still covered up, was just a sense of excitement at how monumental it was. This was enhanced as all the plastic and stones were removed. It is a real contrast the last site I worked at – in Romania, Schela Cladovei – a Mesolithic-Neolithic boundary site on the Danube River. Here, we were working on a single trench, uncovering 50x50cm squares in 5cm spits, and sieving all the soil we removed in order to recover all the smaller finds. Then we got to wash finds sitting in along the Danube in 35°C heat! A slight contrast to the glorious summer weather here in Orkney! It really is such a privilege to have the opportunity to work here and I am looking forward to following the progress of the season, on the blog, from back home in Sydney!